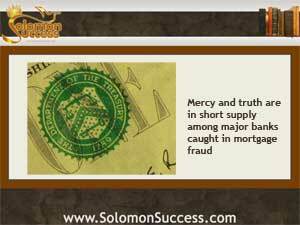 Solomon Success > Blog > Do Big Lenders Lack Mercy and Truth? King Solomon’s Proverbs remind us that honesty and fairness are keys to living a life blessed by God. “Let not mercy and truth leave thee,” the king says in Proverbs 3:3. “Write them in the tables of thy heart.” But, as we’ve noted in this space before, the virtues of mercy and truth are in short supply among the major US banks charged with a variety of fraudulent practices and mismanagement. Now, in a scenario that seems to repeat itself all too often, some of these lenders are facing new charges of deceiving and stalling customers applying for homeowner assistance. In the aftermath of the housing collapse in 2008 and after, a number of big banks, including Bank of America, Wells Fargo and Citigroup as well as several other large and mid-range institutions, were implicated in a variety of foreclosure abuses and fraudulent practices. The case ended with a $2.5 billion settlement to be paid to victims of those abuses, and a commitment by the banks to offer assistance to distressed homeowners. The problems didn’t stop there. After waiting nearly two years for their money, fraud victims had to deal with bounced checks, short check and miscalculations by the consulting firm paid to handle the payouts. And now, according to a report by The Washington Post, attorneys general in New York and other states are receiving complaints that Bank of America, Wells Fargo and some others are taking more than the 30 days stipulated in the settlement to process request for lower monthly mortgage payments. Representatives for Bank of America and Wells Fargo – the two banks specifically named by New York Attorney General Eric Schneiderman – claim that they’re complying with the stipulations of the agreement on processing applications for assistance. But consumer experts say that the latest slowdown is only part of a larger pattern of deliberate obstruction and indifference to the needs of borrowers whose loans these banks service. Attorneys General in North Carolina and Illinois cite instances of banks making multiple requests for the same loan documents, failures to inform homeowners about missing documents in their applications and long lag times in returning calls from applicants. All these actions bring desperate homeowners closer to losing their homes, and, say the Attorneys General, are deliberate violations of the timetables agreed on in the settlement. The settlement and its outcomes are being overseen by a monitoring committee, which is responsible for ensuring that its terms are met. In June 2013, the monitors will release a report on lenders’ compliance with the agreement –and, they say, this report will address concerns that these lenders are still failing to meet those standards. Bank of America, Wells Fargo and their fellow defendants say that they’ve not only met but exceeded expectations, offering billions of dollars worth of refinancing options, loan modifications and other kinds of help to those facing foreclosure. But as long as settlement checks encounter roadblocks and complaints continue, these institutions face an uphill struggle to regain consumer confidence.